Penfield Homestead Museum welcomes you and your family to our last big event of the 2019 season. We will be welcoming over 30 crafters and demonstrators for our annual Applefolkfest. This celebration of autumn will feature crisp apples, apple desserts, chili, hot dogs and live music. 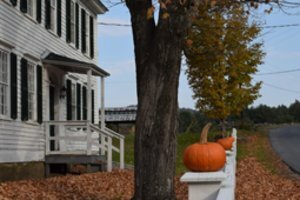 Penfield Homestead Museum and its grounds will be open for the final time this season. You can experience the homestead, barns and grounds at your own pace. We invite you, your family and friends to visit us for a homestead tour, walk along the pond or take advantage of our newest addition – the Pioneer Forge at Penfield. Our new Pioneer Forge was originally part of Frontier Town in North Hudson, NY. While visiting PHM, please take advantage of our Historic Walking Tour, which highlights the Crown Point Iron Company manufacturing and short gauge railroad complex and the 2 Champlain Area Trail System walks – the Penfield Pond and the Old Ironville Rd Trails.